With the advancement of agricultural methods and techniques, the high cost and complicated agri-business has turned now into smart and convenient farming. Agricultural netting is one of such techniques. Netting not only protects plants and crops from birds’ assault, insects and adverse weather conditions, but also upsurge the crops production yields. Netting in farms and gardens results in minimum damage or loss of the plants and their fruits. The amount invested for this will turn into high profits, when the crops will be ripped and ready to sale or utilize. It is seen that the expenses which are incurred on agricultural netting are mostly recovered when the first season of crop cultivation is over. In addition to protecting the crops of birds, the agricultural network also protects them from insects and weather. Netting is available in different types and characteristics. Wide range of nets are offered nowadays which are diversified as per material, dimensions, shapes, thread, fiber, size, cost and weight. One of the types of netting is ‘insect proof netting’, which does not allow pests to reach the plant and protect its fruit from fungal or bacterial infections. These nets produce opaque shading influence with low absorbency and penetrability, which reduces the negative solar effects on the plants. These nets are eco-friendly and concerned with human health as well. Most of the times, this netting is of transparent or white color. While other sort of nets used for agricultural protection are of different green shades. The net turns its color from green to yellow with the life span of crops and turns completely yellow when the fruits are ripped. The agricultural network has different types in the market and the price varies depending on the material of the network. Another type of netting is ‘orchard netting’ or ‘hail netting’ in which high density net is used to protect plants from hailing, heavy rains and other adverse weather conditions. Soil cloth netting is widely used, not only for plants’ safeguard but to make pathways suitable and safe from weeds, plants thorns and spines. Wind break netting is installed at a distance from the crops as this sort of netting breaks the pressure and strength of winds and protects crops from collapse and damages. UV polythene netting is also used which is made up of high density threads. This sort of netting is of high quality and widely produced in Europe. It is low in cost and has long life. ‘English Flat Woven Netting’ is made up of stiff material and dual fiber. It is produced with flat looms. This type of netting is rigid and strong, and commonly used in vineyards. Most of the netting available and used nowadays is long-lasting, defensive from ultra-violet rays and waterproof. Mostly the apparent net has small squared holes of less than an inch size which makes hurdle for a bird’s beak or insect to reach the plant. When the applied netting turns over age, additives are applied to overcome any changes that are caused due to depreciation in addition to wear and tear of the netting material. These additives act as stabilizers and are usually produced from grains with a mixture of HDPE compound. The pressure network is a good option since it reduces the pressure and the force that the winds cause towards crops. Apart from netting, plant training is also practiced by cultivators commonly. Particularly in the production of cucumber, tomatoes, peppers and eggplants, this phenomenon is common. Branches of a plant are pruned to keep them straight and at fixed positions to achieve desired shape and height. This pruning allows grower to choose that how many branches of a plant will be fertilized for fruit production. Plant training also includes plant trellising, which provides crops with better air stream and sunlight to increase their production ability. A plant which is trellised effectively will be able to produce more tasteful and large fruits. 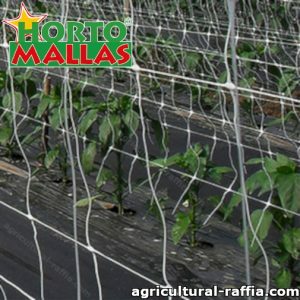 Hortomallas trellising of plants saves time as compared to that which is spent in installation of agricultural netting and assures even high yields than netting. Trellised and trained plants are less exposed to diseases and infections, thus it also saves the cost incurred by growers for sterilizing and disinfecting plants with agrochemicals. Another purpose for which agricultural netting is widely used is pigeon control. Small birds cause great loss to the plants, especially when they are producing fruits. High wired crops are safe from damages caused by birds. Hence pigeon control can be considered as a byproduct of agricultural netting. The agricultural network also works to train plants such as cucumber, tomato, eggplant and pepper plants. Netting support erections made up of wood, steel or cement material are installed at the base or foundation of crops. In case of hail netting, the net is placed inclined over the base structure making a slope of longitudinal fiber threads or wires, which slips and throws down the hails. Growers install these structures to make the plants grow firmly and to avoid any collapse especially when they are loaded with mature fruits. 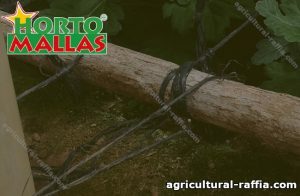 In farms and gardens usually the net is tied with unbreakable cables approximately 30-35 meters high, which is the normal maximum height of trees. 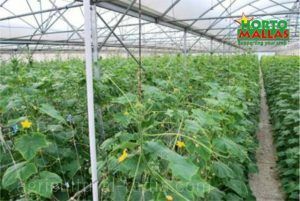 In case of greenhouse production, thermal sheets are also installed along with netting to produce more shading and decrease negative effects of thermal energy. Beautifying and decorating of netting is an optional activity, which is done specifically by home gardeners. Netting is adorned by beads, garlands, ribbons and spare ornamentation stuff at home. The agricultural network can work with the greenhouses where thermal sheets and the network are needed to shade the crops. Protection from insects, birds and small animals like rabbits, squirrel and rats. Protection from bad weather conditions, such as strong winds, heavy rain and hailing. Increase the productivity of fertilized crops. Aid to the life and assure good health of plants. Human health friendly as it protects crops against various bacterial and fungal diseases. Minimize the negative impacts of solar radiations, particularly in greenhouses. The advantages of using the agricultural network are that it helps protect crops from birds, insects in addition to protecting them from weather conditions. The above discussion concludes that agricultural netting is mandatory for farming. 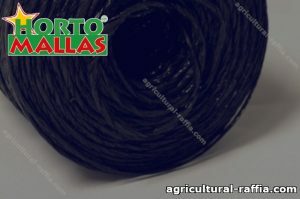 Growers should choose the best and most appropriate sort of netting for their farms or gardens. The right choice of netting is done in consideration with many important factors, such as netting material, characteristics, design, size and cost. Growing plants, fruits, vegetables or grains, need a lot of care and support. Either it’s about home gardening or large scale agricultural farming, plants demand proper maintenance and provisions. 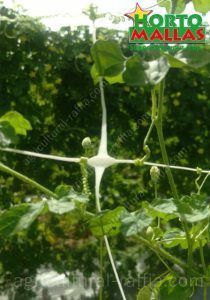 Agricultural raffia twine was one of such maintenance system that was used for supporting fruits loaded branches of plants. Raffia is actually an artificial raw material used in textile industry. It is extracted from polymers and looks like threads. In the light of various evidences, it is worth noting that raffia twine was not actually agricultural raffia twine. This means that the purpose of this product was not to serve in agricultural or farming usage. In fact it can cause real damage to the plants, particularly when they are in fruits’ maturity time. 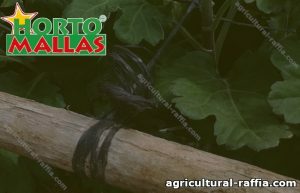 Decades ago, there was ample use of agricultural raffia twine by agronomists because it was cheap, light weighted, robust and easily available. With the passage of time, its preference became obsolete and its usage started to decrease rapidly. The disadvantage of raffia is that it can damage plants. It was fungus adapter. Pestilences of fungal bacteria were commonly observed among threads. These micro-organisms used to stick in twine grooves and produce toxic germs. As the agricultural raffia twine becomes infected, there were high chances of transferring such infections to the agricultural products. The complex structure of raffia applied in plants, needed to be reconstructed again and again, as the size of plants increased with its growth. Great time and labor were spent for these reconstructions. Thus the growers had to bear high labor costs. If a part of netting is cracked, it is not repairable, rather whole net needed to be replaced. Due to its complicated maintenance, either it is replacing a net or modifying its structural design, there was always a threat to the health and life of the plants. 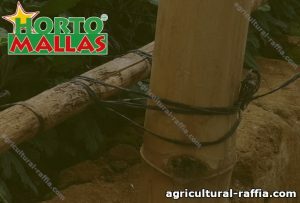 Despite of employing man power and spending a lot of time on building agricultural raffia twine’s structure, the netting could not be used for the second season, but is wasted at the end of cultivation. The raffia has a very complex structure that every time the plants grow it has to be built more than once. Despite of these negative aspects, agricultural raffia twine was used for a very long period of time in agriculture sector. The raffia twine was itself economical and easily adaptable. With its usage, particularly vertical farming was improved. Plants were more open to the sunlight and ventilation, which enhanced their health. It was available in different types and versions. Commonly used types were offered with three or four stands made up of polyester material top. The netting of raffia twine was usually made up of regular fiber threads, sisal webs and twisted nylon threads. Afterwards a number of stake products were launched in market and these products were good substitutes of traditional raffia twine. These products saved the cultivating cost of farmers and also increased their production efficiency. The advantages of raffia yarn are that it is easy to use and gives space to plants and improves their health. One of such agricultural support product is ‘plastic mesh’. They are a sort of plug and play farming device. These plastic meshes are installed quickly in gardens, farms and crops area and need no readjustments or reconstructions with the growth of plants. In this way they save time and labor both. In contrast with the agricultural raffia twine, these meshes are inorganic substances. They can be cleaned by washing and can be reused for three to four times at least. So these are considered as cost saving and improved quality products. There are a number of plant stakes available nowadays for the production of plants and crops. They increase the production capacity of fertilized crops and proven to be the best remedy for the prevention of plants diseases and assure healthy harvesting. Some of these are stood alongside plants and some are tied with the stem of plants. 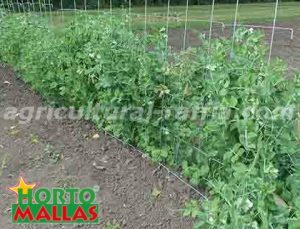 These plant stakes are widely used in growing tomatoes at large scale. They not only support plants in their development but sometimes also make their growth in desired course or direction of the cultivator. These plant stakes are also used in indoor growing of plants such as greenhouses. On the other hand when it is about cultivation on large area field, hail netting is also used for the protection of crops from any damage caused by hailing, storms and other natural disasters. The structure of hail netting depends upon the pattern of plants grown, their quantity and size. Raffia can reduce the stress of the plants and this causes the plants to have a better production. Another simple and cost effective technique to safeguard the agricultural products is ‘tutoring’. The traditional agricultural raffia twine required manual knitting of threads but tutoring is way too simple as compared to that. The fiber rings of tutoring can also be used side by side with other sort of nettings. Sometimes hortomallas are used on different nettings. These are sluggish agricultural chemicals which increase the life and strength of threads which are used in crop netting. Hence the net becomes able to be used over and over. 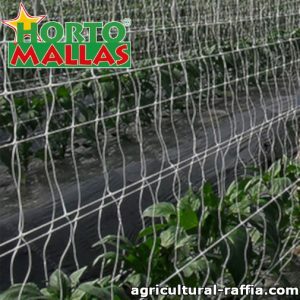 This also strengthens the netting to resist against heavy rainfalls and strong winds. These hortomalls are considered as a perfect replacement to traditional raffia twine. They also decrease the physical stress on plants, specifically when they are loaded with fruits. On large scale, the decrease in this stress leads to a positive increase in the production of agricultural products such as fruits, vegetables, crops and other plants. These advanced products also minimize the necessity of physical variations in plants as cutting off any of the part of a growing plant decreases its growth and fertility. Bean-climbing nets are use for Gardeners or commercial bean farmers for very uses. This is because there are sure sorts that require netting so that it will thrive very well. Bean-Climbing nets facilitates to provide extra space in a farm or lawn and as a consequence helps to enhance increase and might even boom yield at harvest time. By the use of bean nets, you can well plan your farm; set up the bean crops properly to permit for good enough nutrition and air. Furthermore, by lifting the bean plant from the floor with the nets, you prevent lots of different unwanted consequences that can harm you beans. As we shall see below, the usage of netting may be very useful to your bean plants. The exercise of using nets for bean flowers comes with many benefits, and we’re going to outline a number of them below. Netting which can be put up vertically or horizontally, preserves plenty of floor space, for this reason it’s far a completely essential component of farming or gardening in regions in which the gap is restrained. 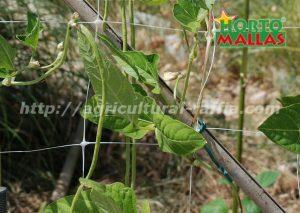 Bean-climbing nets is conventionally used at the walls, fences, and different systems with a purpose to allow the bean vegetation to climb and get proper area for nourishment. It also can be fixed among farm or lawn posts or anchor stakes. After putting in the nets, you could then set up or weave the bean vegetation at the netting in different to get extra area for more beans to move up the nets. Furthermore, because the beans continue to grow, you can upload extra sections of nets with the aid of clipping the nets, so that it will add greater aid. You have to learn how to use bean nets very well before you proceed on making use of it to your farm or lawn. This is due to the fact when the netting is utilized in a correct manner, it can offer appreciably more exposure to sunlight for the beans. Also, proper netting for the beans also can help to circulate air proportionally through the plants. If you plant beans with out proper netting, the overcrowded flowers will likely die from insufficient daylight and air. Bean nets can go a long way to assisting you reduce the amount of beans, which can be lost from floor rot. By lifting the plants up from the floor, with the netting, you prevent the ease by which it can be attacked by pests and insects.This is due to the fact you can aid the increase of the bean flowers withbean-climbing nets in both horizontal and vertical directions. Furthermore, the usage of the nets will let you maintain a consistent length and shape for the bean flora. What is even vaster is the fact that nets also can boom the yield of bean vegetation by way of over fold. This is due to the improved exposure to the sun and air and the protection it offers from pests. 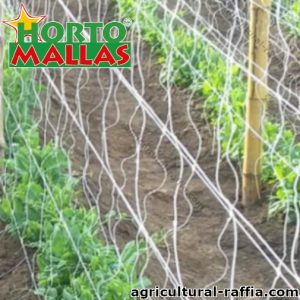 Gardeners or industrial bean farmers all over the world have true expertise of the several uses of bean nets. Especially, because of the fact that there are kinds of beans that require netting so as to develop and yield very well. Bean nets enables to offer more area in a farm or lawn and as a result allows to enhance boom and might even increase yield at harvest time. By the usage of bean nets, you could properly plan your farm; arrange the bean crops well to allow for ok nutrition and air. Furthermore, by means of lifting the bean flowers from the floor with bean nets, you prevent lots of other undesirable consequences that may harm you beans. As we shall see beneath, using netting could be very beneficial in your bean plant life. There are such a lot of advantages you could derive from netting for bean flowers, and we’re going to outline some of them beneath. Prior to the use of bean nets to your farm or garden, you have to research the basics of utilising them very well. This is due to the fact if used efficaciously, netting can offer notably more exposure to sunlight for the beans. Also, proper netting for the beans also can assist to circulate air proportionally through the flowers. If you plant beans without precise and proper netting, the overcrowded flowers will probable die from inadequate daylight and air. Your beans will rot greater if they may be on the floor, bean nets can a long manner to helping you lessen the quantity of beans you will lose when they develop on the ground. This is as it prevents the convenience by way of which it is able to be attacked by means of pests and insects. 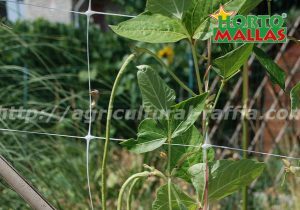 You can help the increase of the bean flora with bean nets in each horizontal and vertical instructions. Furthermore, using bean climbing-nets can help you keep a constant size and form for the bean plant life. What is even greater vast is the fact that bean-climbing nets can also growth the yield of bean plant life through over two fold. This is due to the improved publicity to the sun and air and the protection it gives from pests. You can set up your netting both vertically or horizontally, hence maintaining lots of floor space, which is a totally vital element of farming or gardening in regions in which the distance is limited. Bean nets are historically used at the partitions, fences, and different systems a good way to enable the bean vegetation to climb and get desirable space for nourishment. It can also be fixed among farm or garden posts or anchor stakes. After putting in the nets, you can then set up or weave the bean plants at the netting in other to get more area for greater beans to move up the nets. Furthermore, as the beans keep growing, you could add more sections of nets via clipping the nets, a good way to add more aid. The risk of mechanical stress on plants due to manual operating with raffia twine. Any Methods are able to provide a good protection against the prescence of the pathogens. The pathogens transmission doesn’t necessarily mean that the workers have neglected the hygienic policy. They could have come into contact with the sick plant and then carried pathogens over to the healthy plant by accident. Despite all precautions, there is no guarantee that these two risks can be avoided. However, modern methods enable easier and more secure cultivation of crops. In agriculture as in every other industry being efficient and productive is the only way to preserve the position in the market. It is important to take the maximum from the asset. Modern methods lower costs and reduce risks while simultaneously increasing the yield, and consequently the profit. 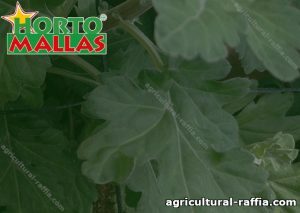 Agricultural-raffia has an excellent alternative in implementing proven horticulture net such as Hortomallas. Its installation is fast and most important; it can be used over and over again. The advantages of such system are numerous. The risk of infection is almost excluded, and the net is far more stable than the single support of raffia twine. The plants can spread over the whole surface, and as they will not suffer from mechanical stress they will grow better. This horticulture net is cost effective on multi-level. You will need fewer workers, and through improving phytosanitary environment you will increase the productivity of your crop. The Horticulture net provide help to your plants for that this can get the best growth. After you have replaced the agricultural-raffia with horticulture net you should take a bird net into consideration. Your plants are not exposed only to risks of infection or mechanical stress caused by manual operating. Birds represent daily danger and serious problem to deal with. They often act like pests making sufficient damage on your fruits, vegetables or seeds. Even the smallest bite disqualifies your fruits and pecking from one fruit to another ruins significant percentage of your production. It is unacceptable, to let the birds compromise throughout the year effort. Bird net protects your trees as well as all kind of berries. It can be implemented on growing tunnels or side ventilation windows. This protection is permanent, efficient, and available in the variety of forms and sizes. It can fit any kind of agricultural surface even the small backyard gardens. When peas and beans emerge from the seeds you can hardly imagine more gentle plant. Soon, they start to grow vertically and they can reach the height of the six feet. 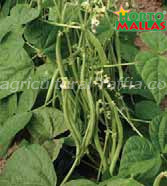 In terms of having the maximum productivity on the limited space, climbing beans are just the ideal choice. Hence, their stems with the heavy leaves and pods need long bean netting that can serve as reliable support. Creating supports of agricultural-raffia, bamboo or recycled material for climbing plants is not an option. It demands a lot of physical effort, time and workers and the final result are not satisfying. There is no guarantee that this kind of support will be strong enough to carry the weight and enough solid to resist the wind. Tall plants are exposed to the wind more than others. 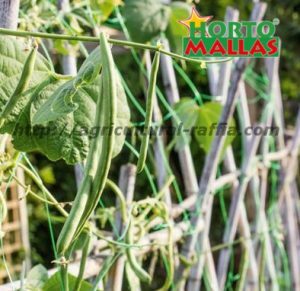 Hortomallas long bean netting is essential to provide the unimpeded growth of the plants. That means enough Sun, water, and space for every single stem. How to Achieve Greater Production? Agricultural-raffia can no longer stand as an optimal solution for tutoring crop but it can continue the career in decorating flower arrangements, tables or presents. It gains popularity on the other side while more and more farmers and gardeners abandon agricultural-raffia for more solid Hortomallas trellis nets. Greater production is the top priority and it is impossible to achieve it without certain investments. High-quality seeds, skilled professionals, and agricultural machinery are not sufficient to guarantee an excellent result while keeping in mind all risks that plants are exposed to, through the long period of their breeding. Providing enough warmth and water will reduce the impact of heavy weather conditions but don’t forget about harmful pathogens and pests. Manual operating exposes your plants to the risk of spreading pathogens from one infected example to many others without even noticing it. It can lead to the loss of the certain percentage of the yield. This damaging transmission can be avoided with the implementation of the trellis net. It provides the healthy phytosanitary environment and eliminates the mechanical stress on plants. With the correct installation of the trellis net , will avoid the mechanical stress of your plants. Regardless of whether the field of your activity is the cultivation of fruit or vegetables, agricultural-raffia is something you no longer need. What you need is continuous protection and reliable support of the crop. Horticulture nets keep the trees safe from birds. They prevent birds from pecking between trunks and making damage on fruits. Thanks to the largest variety of shapes and sizes, the nets suit also all kind of berries. Growing tunnels and side ventilation windows can be hundred percent protected, as well as the small backyard gardens. High climbing vegetables, such as beans and peas are additionally exposed to the wind. Their weight may cause an accidental fall. 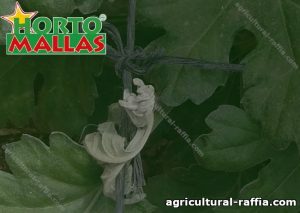 Single support with raffia twine is not a good choice since it cannot prevent plants from struggling for the sunlight, air or space. 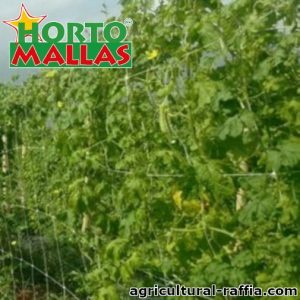 Hortomallas netting has designed to enable independent growth of climbing plants, and it has an additional feature – it looks attractive. Reducing risks on all levels leads to the competitive production.